We have a LitFest exclusive! 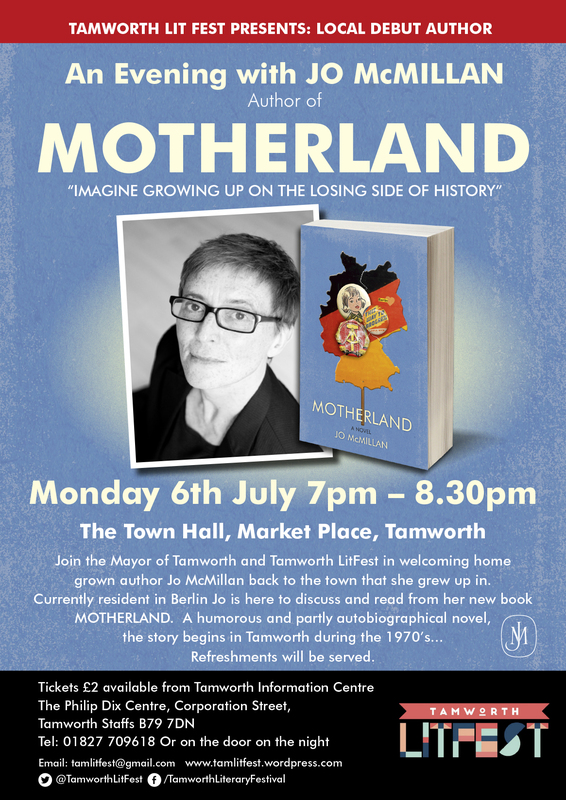 Former Tamworth resident Jo McMillan – who now resides in Berlin – is coming back to the town as part of the launch of her debut novel Motherland. Set in late-70s Tamworth and cold war East Germany, this partly autobiographical tale relates how thirteen year old Jess and her mother leave England and head out into the unknown. Jo will be talking about the book at a ticket-only event at the fabulous Town Hall on 6th July between 7 – 8:30pm. Tickets cost £2 and can be bought from Tamworth Information Centre on Corporation Street or on the door on the night. Though, note that there are only 50 tickets available. Best get a move on then! All money raised will be donated to charities chosen by Tamworth Mayor Cllr Maureen Gant, who will be in attendance too. For further details, click on the poster to view or download it. For more information on Jo and Motherland, visit her website.